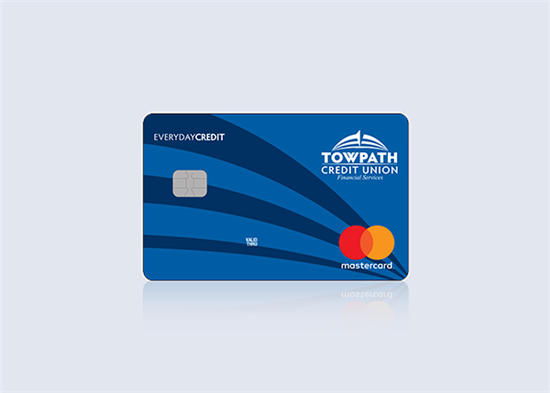 Make purchases securely and build credit with the low-rate Towpath Credit Union EverydayCredit Mastercard ™. Our Everyday Credit card features competitive low rates and low fees. Do you need to make a large purchase or transfer an existing balance from a high rate card? Apply for the EverydayCredit Mastercard™ today! Make payments online, by mail, or in one of our branches! As part of Towpath Credit Union Online Banking you have complete access to your EverydayCredit Mastercard online. Once you become a cardholder, you will need to do a one-time setup with the Towpath Credit Union MyCardInfo website. Once this setup is complete, you can make payments, transfer balances, report fraud or a lost/stolen card, dispute a transaction and much more- all through the Towpath Credit Union Online Banking portal. You can access these features by clicking the "credit card portal" link in Online Banking or the "Card Info" icon in our mobile app. New Towpath Credit Union Credit Card holder? Do your one-time Enrollment in MyCardInfo today or Log In to Towpath Credit Union Online Banking to manage your card now. Click here to sign directly into MyCardInfo. 1. Complete your application in just a few minutes by clicking below. 3. Apply by phone by calling 330-664-4700.
please contact Mastercard directly by calling 1-866-570-1328. This number is printed on the back of your card for quick reference. Lose or misplace your card? Call Towpath Credit Union directly during our business hours at 330-664-4700. You can also call Mastercard 24/7 at 1-866-570-1238 to replace a lost/stolen card. Take advantage of My Alerts, a complimentary service offered by Towpath Credit Union for all Members with an EverydayCredit Mastercard™. These mobile alerts will help you stay on top of any suspicious activity, as we will send you a text immediately to your preferred mobile device or email address. When you follow the link below and register your card you will be automatically enrolled for Fraud Text Alerts. After that you will have the option to select the additional mobile alerts you want. Every second counts, so register today for My Alerts! You can also join our Choice Rewards Program! Earn points just for using your card. You can redeem those points for a wide variety of great rewards. There’s nothing special to do, just use your card to make purchases. Each month, your statement will reflect points earned and total points accumulated. You’ll earn one point for each dollar of purchase. Sign Up or Log In to take advantage of this program. A full PDF of our credit card disclosure can be viewed by clicking here. *Rates are based on creditworthiness up to a maximum rate of 25.00%. The APR is variable and may change after account opening up to a maximum rate of 25.00% APR. APR is current as of 02/27/19. Please contact the credit union for the current credit card rates. Credit card applications are subject to approval. You must be a member of Towpath Credit Union to qualify for our credit cards. Please click the credit card disclosure above for additional details. **Any balances transferred on or between 3/01/19 and 4/30/19 will receive a 1.990% intro annual percentage rate (APR) until 12/31/19. After 12/31/19, variable balance transfer APR as low as Prime plus 3.99% will apply. All balance transfers are subject to credit approval. Terms and conditions subject to change. Some restrictions apply. All balance transfers are subject to a balance transfer fee of 3% of the amount transferred or $10.00, whichever is greater. This offer applies to new balance transfers only; purchases and cash advances are not eligible.